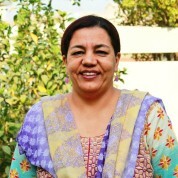 Neelofar is an early childhood educator who currently works for the Rupani Foundation Pakistan. She set up the first Montessori school in Gilgit Baltistan, Pakistan, and thus introduced its Early Childhood Development model and stimulating teaching style to the region. In collaboration with Plan International she went on to establish 34 ECD centers and train 98 caregivers in the Thatta District, providing support for marginalized children in villages. In contrast to traditional approaches where the child is a passive listener, the ECD centres follow a hybrid approach that aligns the Montessori and high scope methods with the objectives of the national curriculum. They acquaint educators with new learning styles, classroom management and teaching methodologies that engage the student and use all five senses. Neelofar has also created a Montessori-based Parental Involvement Program for children aged from 3 to 6. It tells parents how to create a positive parenting environment at home and get engaged in regular story-telling and literacy activities with their children. Both programs have been replicated in Afghanistan and Tajikistan. Join the #TeachersMatter movement by sharing Neelofar Ali’s update.